Politics & P2P: Is Jamendo Violating Creative Commons? There are more and more places to go to for music. There’s iTunes, for instance, but if you don’t want to spend a fortune, or have to deal with the craptastic kludge that is iTunes, there are other options. 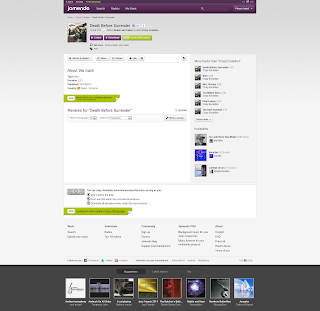 One of those, is Jamendo, a source for Creative Commons licensed music. They have a slightly problem now, in that they might be in violation of the Creative Commons licenses themselves. Jamendo is a source I use a lot. I’ve made videos for the Muon1 project once a week for the last 9 months, for example, and each one has used a music track from Jamendo. 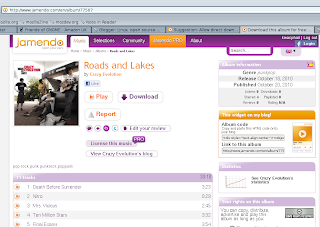 The ability to preview the music on the site, and then download it, with an easy to access license has been very handy. It’s not so handy any more. Last week, Jamendo unveiled a new site design, and it’s enough to make you cry. 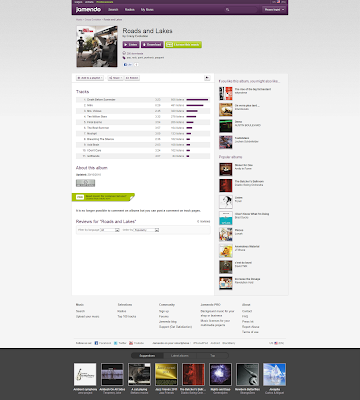 Gone is the nice handy player, the clean design that kept the important information front and centre. Instead it’s now a ‘social’ design, where albums are just arbitrary collections of tracks, and the focus is on comments/reviews, and plugging the ‘pro’ membership. There was one other aspect to the design (which no-one else pointing out flaws with picked up on) that both affected me, and could concern Jamendo. They’ve screwed with the Creative Commons Licenses. In the past, there would be artist pages, and album pages. On the album page, it would list the tracks, and have some information about the album, allowing you to promote it, knowing the facts. Thankfully, the Linux, open Source and Anything Else blog has a screencap showing the basic layout, including where the license was (albeit cut off). The license used to state the conditions, and link through to the human-readable version. 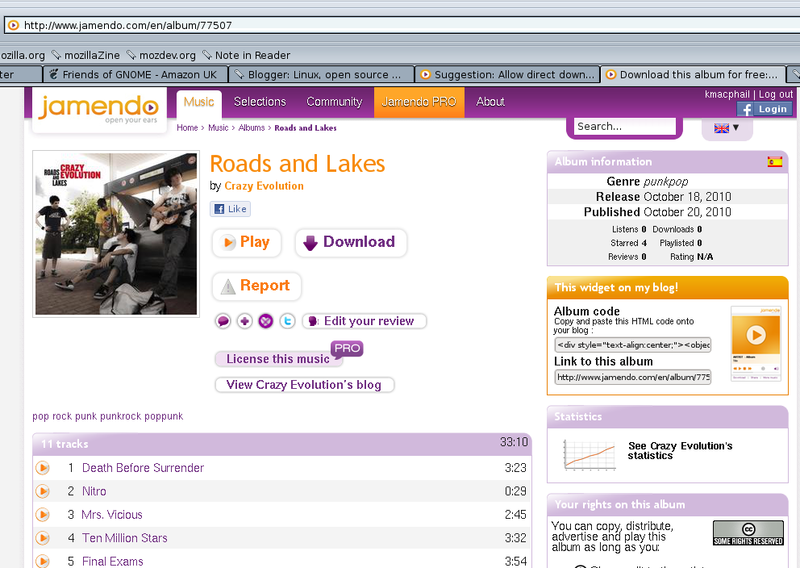 Now look at the NEW layout for the same album. There are some areas that change with a mouse-over – Namely, the track names and the license. So, we have to click through to the track itself now to find out the license it’s available under, while being able to download the track from that page. Handy huh? 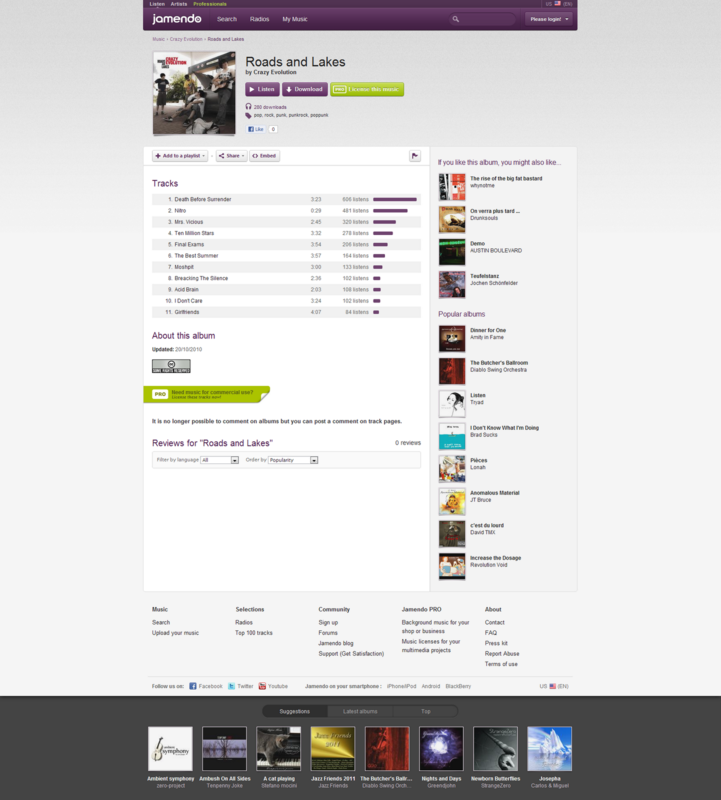 So, what’s on the (new feature) track page? See for yourself. So, you see that license at the bottom? That’s it. There is no more information. There is no link to click, no details of the license or what it means, or even specifics of what version of license, or its locality. It does have three advert spots for their ‘pro’ service however. Creative Commons is quite clear, however, on what makes a best practice for marking media. It’s a website, so there shouldn’t be any issue at all linking to the license. Worse, it’s a practice they’ve used for many years, and just stopped doing. Potentially, since they’re offering CC licensed music, without adequately marking the license, Jamendo could be in violation of that license. It’s now been 5 days since it was pointed out to them and it’s still unchanged. Perhaps they should worry less about fancypants site designs, and more on the legal ramifications of that design.